It seems the gods of the forex market read my previous post on the Japanese Yen, in which I puzzled over the currency’s appreciation in the face of contradictory economic and financial factors. 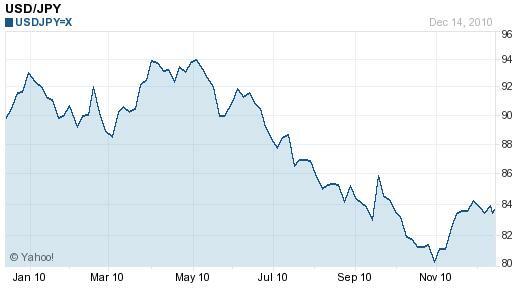 Since then, the Yen’s 6-month, 15% appreciation (against the US Dollar) has arrested. It has retreated from the brink of record highs, and undergone the most significant correction since March of this year. Have investors come to their senses, or what?! You certainly can’t give the Bank of Japan (BOJ) any credit. Aside from its single-day $25 Billion intervention in September, it hasn’t entered the forex markets. In fact, it has already repaid the funds lent to it by the Ministry of Finance, which suggests that it doesn’t have any intention to replicate its earlier intervention in the immediate future, regardless of where the Yen moves. The same is true for risk-averse capital. For reasons of liquidity and psychology, the Japanese Yen will continue to be a safe-haven destination in times of distress. Still, it’s hardly superior to the Dollar, in this sense. Inflation is slowly emerging (or at least, the risk of deflation is slowly abating) in Japan, and it could conceivably reach 1% this year if the Bank of Japan has its way. Its proposed 35 trillion yen ($419 billion) of asset purchases dwarfs the comparable Federal Reserve Bank’s QE2 program (in relative terms) and contradicts the notion that the Yen is the best store of value. 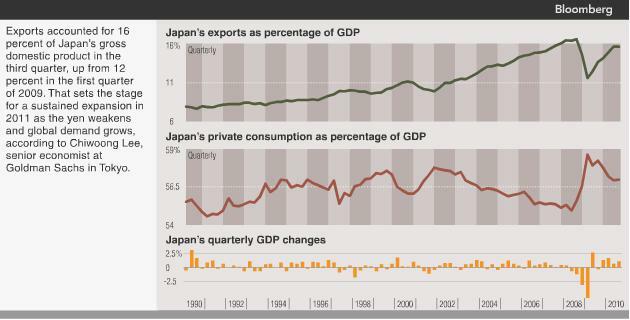 Finally, the Japanese economy remains weak, and vulnerable to a double-dip recession. On the one hand, “Japan’s economy expanded at an annual 4.5 percent rate in the three months ended Sept. 30.” On the other hand, its economy remains heavily reliant on exports (see chart above, courtesy of Bloomberg News) to drive growth, which is complicated by the expensive Yen and concerns over a drop-off in demand from China and the rest of the world. In fact, “Exports rose 7.8 percent in October, the slowest pace this year, while industrial production fell for a fifth month and the unemployment rate climbed to 5.1 percent.” In addition, the closely watched Tankan survey registered a drop in September, “the first fall in seven quarters.” While Japanese companies are still net optimistic, analysts expect that this to change in the beginning of 2011. 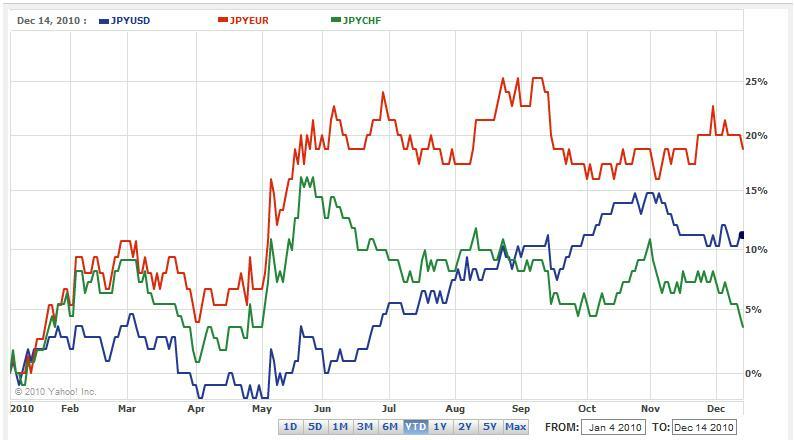 For the rest of the year, how the Yen performs will depend largely on investor risk-appetite. If risk aversion predominates, then the Yen should hold its value. In addition, it’s worth pointing out that even as the Yen has fallen against the Dollar, it has appreciated against the Euro, and remained flat against a handful of other currencies. Against the US Dollar, however, I still don’t see any reason for why the Yen should trade below 85, and I expect the correction will continue to unfold. We got in USD/JPY Long around 82.00, we have a stop below 80.00 and target at 86.00 (previous spike high). Thanks for the article, It gives me confidence in this position! I have long position in USD/JPY, stops below 80.00 (i think that it is really good support) and take profit at 90.00.